After a damp first session at the Montreal circuit, drivers geared up to make the most of another ninety minute opportunity to get some practice under their belts. The Pirelli experimental tyres were in action after being forced to stay in the garage this morning, and drivers found a lack of grip as they pushed to the limits. About halfway through the session, the softer tyres went on the cars and it was long fuel runs for all, leaving the fastest times to come from the middle of the session. It was a good battle while it lasted, but there could only be one ending the session on top. If you missed any of the afternoon practice, relive the session with some bonus Factbyte Factbox live coverage. Hello there, welcome along to a bonus FBFB for second practice in Canada. The timings work out that I have some post-work Formula One to enjoy, so I thought I'd do some live coverage while I was at it. Surprise! First practice this morning was wet, although not actually raining during the ninety minutes itself. 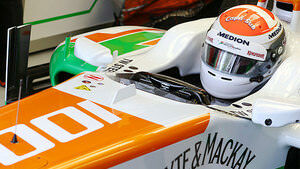 Paul di Resta posted the fastest time of the day - 1:21.020. Pastor Maldonado came a bit unstuck, crashing at the fourth corner and losing his front wing. The yellow flags came out but the session continued onwards. Commenting from Montreal, Bert says: "It has not rained any more, so the track should be a bit dryer. There was a 1 hour Canadian Touring Car qualifier, so that should help a bit..."
Tyres in use this weekend, in amongst the wets and intermediates, are the white medium compound, and the red supersofts. There was a brief marmot sighting there, as the groundhog-shaped mammal dashed across track and disappeared. It's a busy start to the session, with 19 drivers heading out straight away to get a feeling for the surface. In fact, make that 20, as just Sebastian Vettel and Felipe Massa remain inside. The track has completely dried up from this morning, as Kimi Räikkönen sets an early benchmark time. 1:19.090. Not even five minutes in, and Sergio Pérez has already had a brief excursion off track at turn ten, but he's managed to continue. 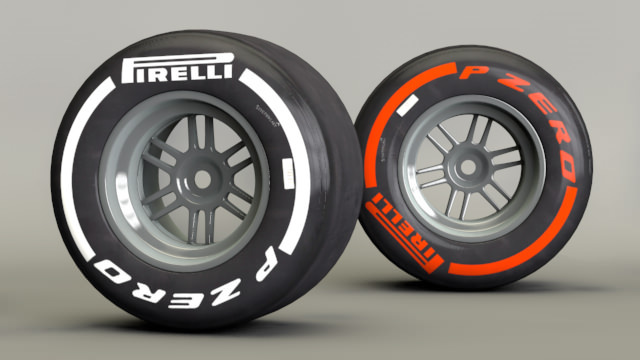 There's a special Pirelli development tyre in use today only, recognisable as it has no sidewall markings at all. The times have dropped significantly already, with thrice pole-sitter Nico Rosberg setting a 1:17.332. Pérez has returned to the garage, where Vettel is the only driver yet to make an appearance. Replays show Vergne struggling to slow his car down and completely missing the apex of turn 14. Quite a few drivers finding the limits of the track, and going beyond them, missing apexes here there and everywhere. Team radio to Felipe Massa: "Top speed on this lap, constant speed from turn five on the next lap." Much of the field returning to the safety of the garage, after their first stint. Di Resta returns to the top, pushing Webber down, the benchmark now a 1:16.382. The BBC's Gary Anderson points out that Red Bull have a windscreen wiper style bottle somewhere in there car with the flo-viz, so that rather than getting the effect straight away from the pitlane, they can deploy it at a desired point around the track. Alexander Rossi, in the commentary box for the Beeb, says he'll definitely be going back and telling that to Caterham. Sebastian Vettel is making the most of the emptying track, he's on his fourth lap now, and currently sitting 14th. And Vettel improves to tenth place, he's just 1.2 seconds off the pace at the moment. Felipe Massa takes P1, with the time now 1:16.001 - inches away from dropping into the 1:15s. Alonso gets it all wrong, narrowly avoiding the barriers as he fights to keep control of the skittering Ferrari. Giedo is asked over the radio for his comments on the development tyres, he said: "Quite bad actually, can't get them up to temperature, and there's no grip at all at the front end." Brief yellow flags as Webber spins off track and has to wait for some traffic to pass before righting himself and continuing onwards. Replays show Webber moved to the racing line a bit too late, braked late and lost the back end. He swung out across the run-off area, lucky there wasn't a barrier at that particular corner. Bottas has taken his turn for a spin, at turn ten, but he's also managed to keep it going. There's lots of work going on in the McLaren garage, as they prepare Jenson Button to go back out again. Sergio Pérez heading out for his last stint on the medium tyres. The Mexican has now returned to the garage, currently sitting in fourth fastest position (via @McLarenF1). Felipe Massa is back in the pit lane, he is still holding on to the top spot, as we wait to see who can drop into the 1:15s first. Interview with Pedro de la Rosa, Ferrari reserve driver: "There's so limited time in dry conditions, even though the track in Canada will get better and better, it's extremely green at the moment. We did the first run, we tried the proto tyres, now we're trying a new wing. There are lots of parts, aero-specific, that we have to try before tomorrow." It's Lewis Hamilton that drops the time, taking the top spot with a 1:15.702, knocking almost three tenths off Massa's previous best. Romain Grosjean heads out from the Lotus garage, the Frenchman is currently in 11th place, via @Lotus_F1Team. Meanwhile, at the rear of the field, Giedo van der Garde has bolted on the supersoft tyres - he's sitting 21st, with only Max Chilton behind him. Nico Hülkenberg is struggling this afternoon, he's said: "Something's absolutely not working with this car" and is finding the chassis bottoming out constantly. He's sitting 19th, just ahead of Pic. Fernando Alonso is gradually improving his time, he moves to fourth with a 1:16.137, but is pushed down to fifth as the times continue to drop. The track is emptying once again, with just seven drivers remaining out on the circuit. Sebastian Vettel has put the supersoft tyres on now, along with Jean-Éric Vergne. Three drivers have tried the red stripes now. Super-slo-mo replays show Adrian Sutil bouncing over the kerbs with all four wheels off the ground, once he lands, he four-wheel drifts in towards the Wall of Champions. Remains in control though. Good drifting skills! Just Alonso, Massa, Vettel, Vergne and Bottas remain circling the Montreal track. Sebastian Vettel drops in to the top spot, lowering the time to beat to 1:15.378 - that's the supersoft tyres for you. Hülkenberg's car is in bits in the Sauber garage, as the team try changing the brakes - a Brembo man is supervising the swap. Mark Webber improves on his teammate's time to leap into P1, and then Vettel tops him. The Red Bull duo battling for supremacy at the moment. Vettel returns to the garage, leaving Webber to fight with himself. The Australian improves, dropping the P1 time to 1:15.212. Half the field have now moved to the supersoft tyres, with the rest likely to follow as the second half of the session unfolds. Charles Pic locks up massively, running wide off track, and giving his current set of medium tyres a pair of matching flat-spots. Hamilton takes us closer to the 1:14s, with a 1:15.006. There's forty minutes of the session remaining, and talk of little spots of rain starting to be felt in the pit lane. Nothing major, but more rain is expected. The FIA radar from Météo-France: "No rain expected at the moment. A few drops are possible at times." Team radio from Paul di Resta: "I think there's something wrong with the fuel pickup or something." Hamilton's impressive laptimes continue, pushing the benchmark down to a 1:14.830. Alonso's about to beat that though, as he crosses the line with a 1:14.818. 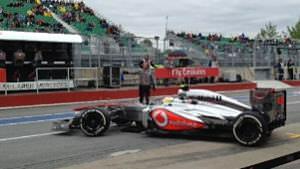 Jenson Button crosses the line to start a new lap. The Brit is sitting down in 15th place, but has supersofts on now and is charging for a better time. Radio informs the McLaren driver that Vettel is behind him, but the Red Bull driver likely is stock full of fuel. Button's time does not improve as he runs across the chicane instead of around it. We've got some excellent footage from Valtteri Bottas's helmet cam. It really makes me dizzy watching it, but a good insight into how little the drivers can see of each corner. Hamilton is the latest driver to have a bit of a spin off track, but they all seem to have calmed down a bit now. Most of the spins earlier came on those low-grip development tyres. Just over twenty minutes remaining, and the drivers are starting to hit the track for their long runs. Webber gets some radio encouraging him to do a longer run on his current set of tyres. Massa locks up at the hairpin, leaving a very grim-looking front right as he continues onwards. I've been concentrating on the top, and have mentioned the bottom, but who's in the middle? Räikkönen is currently sitting in 11th place, just ahead of Sergio Pérez - good job it's just theoretical placement, lest we forget there's no love lost between those two. Di Resta's early session pace has dropped off, and he's down in 13th now, and currently still in the pit lane. Pastor Maldonado and Valtteri Bottas are 14th and 16th respectively, whilst the two Sauber drivers sit behind them, Hülkenberg still unhappy down in 18th. Bianchi leads the new team battle, ahead of Pic, Chilton and Van der Garde bringing up the rear. Just fifteen minutes left then, and we won't see many improvements as the rest of the session plays out - it's long-fuel runs all round. All bar Webber, Räikkönen, Di Resta and Pic remain in the pits, otherwise the track is super busy. Button has been reporting some gearbox issues, feeling some downshifts have gone into neutral rather than gear, but the pitwall say it is just a sensor issue and they are not too concerned. Replays show Pastor Maldonado running off track and into the muddy grass. Front wing remains attached this session though. The track may be getting slippery, as we're starting to see drivers struggle again. There's some racing going on, as Alonso is stuck behind a Toro Rosso and sweeps past it on the straight. JB: "I selected 7th and the box went into neutral. Don't know whether to continue or not but I'm in the pitlane?" Team: "It's okay to continue, drive on through." JB: "Can you tell me what the issue is?" Team: "It's a sensor issue in the gearbox." JB: "It's done it again." Team: "Okay, box this lap. Sorry about that Jenson." A view from the grandstands from our weather correspondent @drydenlewis. More racing, of sorts, as a Red Bull drags its way past a Mercedes and scampers into the distance. Replays of Jules Bianchi's car show plumes of thick black brake dust spewing from the front of the car - that's going to be a tough race for the Marussia. Alonso crosses the line for his 47th lap of the afternoon, he's been the busiest man of the session. Button has completed the fewest laps, with just 29 for the McLaren. He abandoned his afternoon's running a few minutes ago and climbed from the car. The engineer's room at Caterham, with lots of busy bees analysing the data, via @JoeIrishF1. A couple of crushes here, but good to have a visual for how close it was for P1. Red Bull complete some practice pit stops as the cars return to the garage and the debriefing work begins. There's one more hour of practice for the final preparations tomorrow morning, and then each and every driver will get a chance to fight for pole position - some with more hope than others! I will be back then with more live coverage, hopefully you will join me!